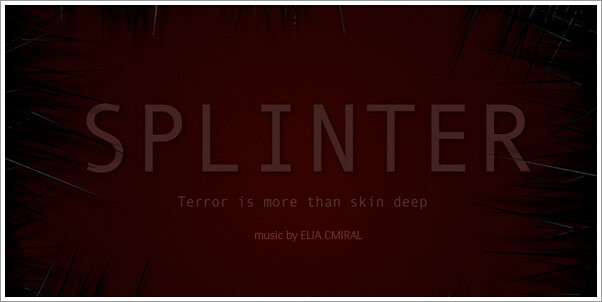 (Los Angeles, CA) Composer Elia Cmiral creates a haunting score for “Splinter,” the first full-length film by award-winning director Toby Wilkins. In the film, a convict and his girlfriend carjack a couple on a weekend retreat in the woods. The couples soon find themselves trapped together in an isolated gas station, on the run from a deadly parasite that occupies the woods outside. Cmiral will attend the film’s premiere at ScreamFestLA as the festival’s Centerpiece film on October 16, 2008. It opens in theaters on October 31, 2008. ScreamFestLA, a film festival devoted entirely to the horror genre, showcases some of the best independent short and full-length horror films each year. “Splinter” director Toby Wilkins won Best Horror Short for his film “Staring at the Sun” in 2005, garnering the attention of producer Sam Raimi, who then chose Wilkins to produce, direct, and write a number of short films for his production company, Ghost House Pictures. This year, the festival runs from October 10th to October 19th at Grauman’s Mann Chinese 6 Theatres in Hollywood, Calif.
Born in Czechoslovakia, Elia Cmiral quickly established himself as one of Europe’s leading young composers after graduating from the prestigious Prague Music Conservatory. He wrote scores for several European films and three ballets before coming to the United States to attend USC’s famous Film Scoring Program, after which he was hired to produce tango-based music for “Apartment Zero,” composing a now-classic full length score in a scant ten days. By the mid-1990s, Cmiral had garnered a reputation with Hollywood executives, leading to his scoring the successful “Nash Bridges” television series.